Right after we landed after our morning flight over the Nazca Lines, we couldn't be happier to stand again on the firm ground. I think it took the whole afternoon to get over nausea and to realize how amazing thing we've just experienced. We don't want to put you off from taking a flight over Nazca Lines, rather the opposite, but we also don't want to conceal the fact that this trip is not for the weak stomach. But you know how it is when you decide you need to see something - everything goes aside, and in this case, we were not different. We wanted to experience the flight over Nazca Lines and had to step outside from our comfort zone (as many times before on our South American trip). If you plan on visiting Peru, you've probably already heard about Nazca Lines and thinking if this place is worth to have a rightful place on your itinerary - well, we hope after reading this article you won't need to think about it anymore. In case you, after all, haven't heard about Nazca Lines yet, keep reading, it is a unique site, unmatched anywhere in the world. NAZCA LINES: WHAT IS IT? What we like the most about Nazca Lines is how the formation and the reasons for their creation still remain a mystery, although an uncountable number of scientists try to decipher their origin for more than 90 years already. What is known for sure is that lines were made by Nazca people (old pre-Inca civilization) and are approximately 2000 years old! The Nazca Lines are geoglyphs and large trenches drawn across the Nazca desert. There are thousands of lines and geoglyphs depicting animals, plants or humans, but the flight will take you around approximately 12 the most famous ones. Although the exact purpose is still unknown, there are many theories offering several explanations. Some theories say lines were drawn with astronomical and cosmological purpose some say that lines show directions where the water is (it had to be important for Nazca people as until now water in this area is valued commodity) or the most supported theory says people at that time walked along the lines as part of religious rites. And of course, the theory that aliens did it cannot be missed on the list. Unfortunately, Nazca people hadn't left any writing records about their actions, so we can only guess. Nazca Lines were first mentioned in the book in the 16th century but were not further studied until the 1930s when Peruvian military pilots could spot them better from above. Interesting is that Nazca Lines thanks to its position, constant climate and lack of rain were naturally preserved until today. Nazca people created the lines by scraping off the top layer by removing the oxidized dark layer to reveal a yellow and lighter subsoil underneath. This colored pampa floor lies only 10 - 15 centimeters below the top layer. 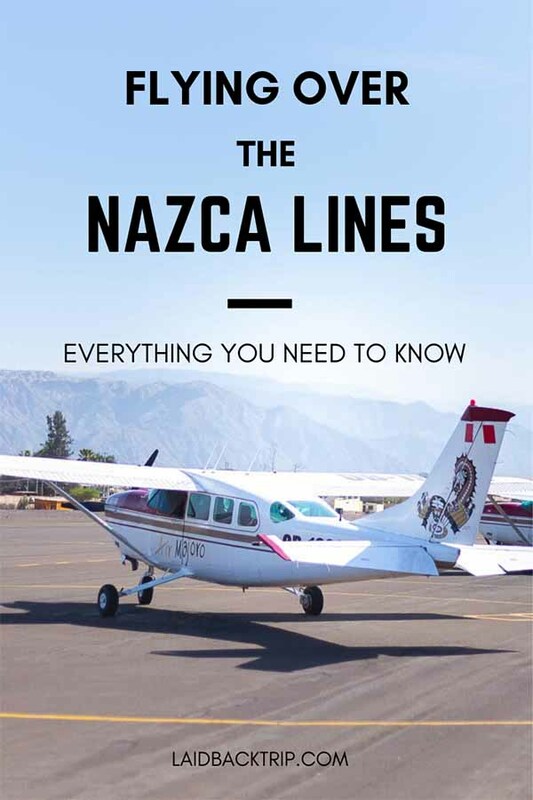 You have two options how to see the Nazca Lines: viewing tower or airplane. Viewing Tower | For those traveling on a strict budget or for those who are afraid of flying in small planes and still don't want to miss seeing Nazca Lines is here a viewing tower. For a small fee, you can climb the 13 meters high tower and observe three of Nazca figures. To get to the tower on cheap, take a bus from outside Cruz del Sur bus station for S/3. After experiencing the flight over Nazca Lines, we are unfortunately convinced that arriving in Nazca to see the lines only from the viewing tower is not that spectacular and not worth the stop (although we've read many articles saying otherwise). Yes, the flight over the Nazca Lines cost around $80, but it is not a fortune compared to all expenses all travelers have while visiting Peru. Airplane | The most popular option and also the way which will allow you to see the iconic geoglyphs the best. Price varies from $70 - $100 (depends on season and your negotiation skills) for 30 minutes flight. Plus you must pay tax at the airport, additional S/30. The capacity of planes differs from 6 - 12 passengers (every traveler has a window). We flew in the smallest one and can't recommend it enough. The flight tour includes pick up and drop off in the hotel. The flight was incredible and let us fully appreciate the scale of gigantic geoglyphs which are also for their uniqueness protected by UNESCO. Nowadays the biggest thread for the Nazca Lines is a climate change and human development such as Panamericana road crossing the desert (and even splitting some geoglyphs and lines in the middle!). A few years ago there were many companies offering flights and many aircraft which did not have an appropriate technical check which caused many planes crashes - since then the situation has changed. The government of Peru stepped in and imposed tighter regulations, so only the fraction of companies could carry on in their business. We flew with AeroParacas, one of the most reputable companies you can find in Nazca town and everything went smoothly. Because the plane is really small (and not that stable) and the pilot makes several sharp turns to ensure everyone on each side of the plane see perfectly, we must warn you that you can feel a bit nauseous during those 30 minutes (and although a half an hour might seem like a short time, it was absolutely enough for us - there is one longer route for the real enthusiasts though). To enjoy the ride the most, we recommend booking an early morning flight. Not only it is usually not windy, but also lines are not red-hot and are better visible. Also, do not eat breakfast. Maybe we are overreacting, but we are glad we did not have breakfast before our flight, because we really did not feel well. If you take an early morning flight, you still should be back in your hotel to have your breakfast after. Take a motion sickness pill. To have everything covered, we took a motion sickness pill. Not sure it actually worked, but we don't want to know how it would have looked if we hadn't used it. Nazca town has a very compact center with many hotels, restaurants and travel agencies. We stayed in fairly new and budget-friendly Nasca Travel One Hostel, or you can search for accommodation in Nazca HERE.